Short Breaks are available in most locations. Pets welcome in most properties. Choice of 1 or 2 bedroom pine lodges set in spacious grounds 2 miles from historic Jedburgh. Fully equipped. Balcony and patio furniture. Available per night or per week. Ideal location for visiting historic homes, castles and abbeys, or for fishing on the River Tweed. 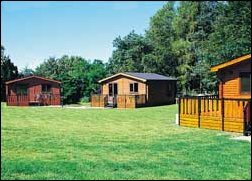 Choice of 2 or 3 bedroom caravans and 2 or 3 bedroom pine lodges. 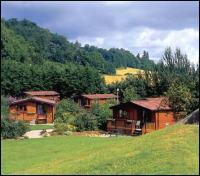 Peaceful holiday park in a lovely parkland setting. Facilities on site: launderette, putting green, adventure play area. Country parks, nature trails and castles nearby. Winter skiing at nearby Glenshee. Luxurious 1-bedroom log cabin with king size four poster bed, double whirlpool bath, plus separate shower, sauna and private hot tub. Scottish Tourist Board 4 Stars. Ideal for romantic breaks. Situated on a working farm with views across the countryside. Near the picturesque village of Glenfarg. Perth 12 miles. St Andrews 25 miles. Edinburgh and Stirling 40 minutes drive. Riding, walking, loch fishing, castles all nearby. No pets. or detached timber lodges with 2 - 3 bedrooms. Pitlochry 13 miles. Aberfeldy 13 miles. Kenmore 12 miles. Blair Castle 20 miles. 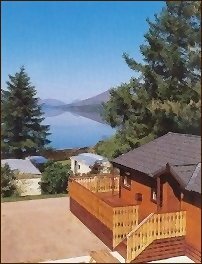 Excellent choice of accommodation - caravans, lodges or the luxurious Clan Lodges. 5 star Clan Lodge with kingsize 4-poster bed & ensuite shower, 1 twin bedroom & bathroom with sauna and whirlpool bath. Kitchen. Lounge and dining area with balcony. Sleeps 4. 4 star lodge with 1 double and 2 twin rooms (sleeps 6) plus sauna, whirlpool bath and separate shower. Kitchen. Lounge and dining area with balcony. Also luxurious lodges with 4 bedrooms sleeping 8. Spacious 12ft-wide caravan with 1 double and 1 twin. Additional sleeping for two in the lounge area. Shower. 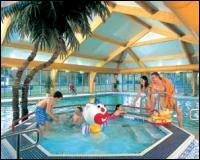 Facilities on site include: children's adventure play area, lounge with TV/pool tables, launderette, shop & boat hire. Private bay with a sandy beach. Ideal base for fishing, watersports, hill walking, touring. 40 miles from Glasgow. Award winning multi-leisure resort set in parkland near the village of Fowlis. 5 miles from Dundee. Perth 18 miles. Choice of 4 star log lodges with 1, 2, 3 or 5 bedrooms. All with balcony, TV, DVD, microwave, dishwasher and washer/dryer, etc. VIP lodges have a sauna & outdoor hot tub. 1-bedroom VIP lodges also have a four poster bed. Restaurant & bar with views of the loch and golf course. Leisure facilities include indoor swimming pool, sauna, steam room, spa, gym. 18 hole golf course and 12-bay driving range. Well stocked 40 acre trout loch for boat & bank fishing. 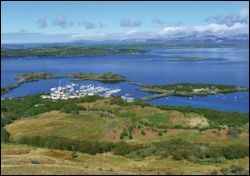 A choice of 3 Scandinavian log lodges set on the Island of Buidhe connected by causeway to the mainland. Kilmartin 10 miles. Lochgilphead 17 miles. Oban 22 miles. A luxury 1-bedroom lodge with kingsize 4 poster and child size single bed, plus sauna and double whirlpool bath. Ideal for romantic breaks and honeymoons. Choice of two luxury 2-bedroom lodges each with 1 canopied double bed (& personal sauna) and 1 twin room. Outdoor hot tub. Surrounded by spectacular scenery. Ideal for wildlife watching, walking and watersports. A choice of caravans, A-frame or traditional style single storey lodges. Overlooking Loch Goil, only 14 miles from Loch Lomond. On the estate with the impressive Drimsynie House Hotel. Leisure pass access to swimming pool, sauna, whirlpool bath and steam room. Facilities on site include: indoor & outdoor play areas for children, badminton, table tennis, snooker, bowling, crazy golf, 9 hole golf course. Shop, serviced laundry, bars, restaurants. Evening entertainment. Ideal base for golf, pony trekking, tennis, fishing, walking. Scottish Tourist Board 5 star holiday park. AA 5 Stars. 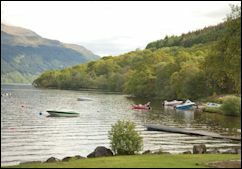 Best Scottish site in the AA Campsites of the Year 2011 awards. Selection of holiday caravans with variety of facilities and 2 or 3 bedrooms. Some caravans are wheelchair friendly, and some can accept pets. Pitches for touring caravans, motorhomes & tents. Pine chalets also available. 5 miles from Fort William in a beautifully landscaped lochside park. Shop, launderette, adventure playgrounds, pet exercise areas, drying room for sports equipment, toddlers' play room, baby bath & changing facilities, dish washing room, tourist info, WiFi hotspot. Heated amenities with private cubicles and baths. Free fishing & boat launching available from the park's private beach. 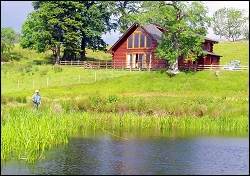 Choice of accommodation on 500-acre working farm with sheep and Highland cattle. Located 3 miles north of Fort William. Superb views of Ben Nevis. 6 Scandinavian timber-lined chalets sleeping 4-5 (2 bedrooms, bathroom, kitchen, lounge, balcony, BBQ). Lone Pine Lodge sleeps 6-7 (3 bedrooms, 2 bathrooms, lounge, kitchen, balcony). Nevis Lodge sleeps 8 - 9 in 4 bedrooms (3 double & 1 twin) and 1 sleeping loft. 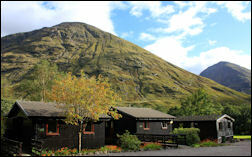 Choice of lodges and chalets (sleeping 4 - 5) set in the grounds of the award-winning Clachaig Inn, Glencoe. Magnificent mountain views in all directions. Each property has 2 or 3 bedrooms, lounge, central heating, kitchen with cooker, microwave, dishwasher, washing machine, etc. Scottish Tourist Board 4 Stars. Dogs welcome. Availability calendars & online booking. Convenient for local shops, hotels and amenities. Choice of apartments and chalets by Aviemore set around a 9-hole golf course bordering the River Spey. Spectacular views towards the Cairngorm Mountains. Indoor heated swimming pool and spa pool. Sauna, steam room and solarium. Gym. Lounge bar with entertainment and competitions. Restaurant and bar food. Snooker & pool, table tennis, adventure playground, badminton, squash, tennis, indoor bowls. Soft play area. Hairdresser & laundrette. 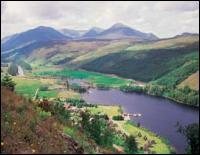 Choice of Scandinavian lodges and brick built cottages near Spean Bridge. Surrounded by magnificent scenery on the shores of Loch Oich and Loch Lochy. 20 miles from Fort William and also close to Ben Nevis mountain range. The park offers a variety of watersports and outdoor activities including white water rafting, speed boat trips, water skiing, windsurfing, kayaking/canoe courses, motor boat hire, sailing, pedalo. Abseiling, climbing courses, mountain bike tours, guided walks, clay pigeon shooting, archery, fishing, etc. Facilities on site also include: indoor heated swimming pool, sauna, solarium, spa bath. Coffee shop and restaurant. Children's play area and games room. Half size tennis court. 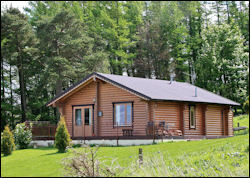 Choice of 2 and 3 bedroom Scandinavian style lodges near Tain. 26 miles north of Inverness. Woodland setting a short walk from the shores of a private loch (with rowing boats and fly fishing). Facilities on site: bar, restaurant, shop, launderette, children's play area, pony trekking. Detached timber chalet at Upper Banavie - sleeps 4. Just 4 miles from Fort William. Panoramic views of Ben Nevis and Aonach Mor. 2 bedrooms, lounge/diner, kitchen, shower room. Skiing, climbing, hill walking, canoeing, cycling and fishing are all available locally. Set in open countryside with magnificent views of Ben Nevis near Fort William. Log cabin (sleeps 6 in 3 bedrooms). Timber lodge (sleeps 4 in 2 bedrooms). Caravan (sleeps 4 - 6 in 2 bedrooms). Apartment (sleeps 2 in 1 bedroom). Facilities on site: shop (May - September), laundrette, children's play area. 360 degree virtual tour online. Walking, fishing, sailing, boat trips, golf, pony trekking, winter skiing nearby. 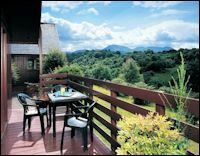 Choice of 2-bedroom caravans and 2-bedroom luxurious pine lodges overlooking the River Spean with views of Ben Nevis. 4 stars. Located near Spean Bridge at the south end of Loch Lochy. 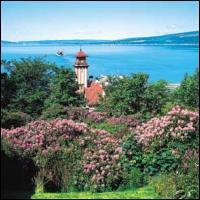 10 minutes walk from the Caledonian Canal and the Great Glen Way. 20 minutes' drive from Fort William. Ben Nevis 11 miles. Inverness 56 miles. Oban 54 miles. Aviemore 53 miles. Facilities on site: children's play area, barbecue area and launderette. Sailing, fishing, walking, winter skiing nearby. A choice of comfortably equipped 2 and 3 bedroom caravans. Nestling between sand dunes, a beautiful marina and a championship golf course. On the stunning Moray Firth coast which is home to schools of dolphins. 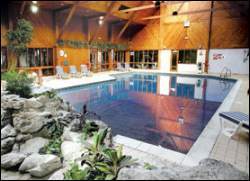 Facilities on site include: heated indoor pool, whirlpool bath, sauna, crazy golf, pool table, children's adventure playground, children's entertainment for 5-10s. Supermarket & launderette. Restaurant & bar overlooking the marina. Ideal for exploring the Scottish Highlands. Inverness (17 miles). A choice of 2, 3 and 4 bedroom Scandinavian timber lodges (some with private outdoor hot tub). Woodland setting. 1 mile from the historic market town of Newton Stewart, 50 miles from Dumfries. Facilities on site include: children's playground, BBQ, tennis, launderette. Adjacent to an 18 hole golf course. Fishing nearby. Close to the Galloway Forest. A choice of 2 and 3 bedroom caravans. Only 40 minutes' drive from Glasgow. Nestling on the wooded slopes of a small coastal village, with spectacular sea views across the Firth of Clyde towards the Isle of Bute. Facilities on site include: indoor heated swimming pool, sauna, watersports, sports field, French boules, nature trail, play area, target golf, amusements, kids clubs and teenage events. Bars and food. Mini supermarket & launderette. Wide range of comfortable, well equipped caravans. with red squirrels and the David Bellamy Gold Award for Conservation. Cycle hire, fishing, golf, mountain bike trails, walking, cycling, birdwatching. 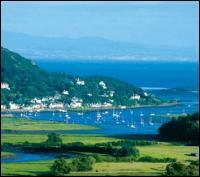 15 minutes walk from the pretty seaside village of Kippford, Dumfries-shire. Close to Ayr's popular beaches and the beautiful Ayrshire coastline. Facilities on site include: new indoor pool complex, crazy golf, adventure playground, all weather multi sports court, mini 10-pin bowling, games room. Maxi Million's Children's Club and Freestyle Club for teenagers. Supermarket & launderette. Bar and restaurant. Family Theme Park 25 miles away. Easy access from Glasgow.